More details from each rider in the comments! Coldest temperature wins. If you go 100 miles in 20°F, and somebody else only does 10 miles in 19°F, 19°F wins. Distance is relevant only to break ties. This is just for fun, and on the honor system. Don’t lie or cheat. Contest starts at 12:01 am on November 27, 2009 ends at midnight on Feb. 28, 2010. NEW: Rye set up a CWC Flickr Pool if you’d like to include your photos there, or email them to illnoise@2strokebuzz.com. Please use the comment thread of this page for entries only. Badmouth, backpat, and brag in comments to updates on the main site, not in this thread. Good luck, and be safe. This is a non-commercial, totally unsanctioned event and is being held informally just for fun and bragging rights. The organizers accept no liability for injury or property damage. Riding in cold weather is even more dangerous than riding in warm weather, don’t ride outside your comfort level or take unnecessary risks Riding in snow and ice is particularly dangerous, we recommend riding only on clear days with good road conditions and visibility. 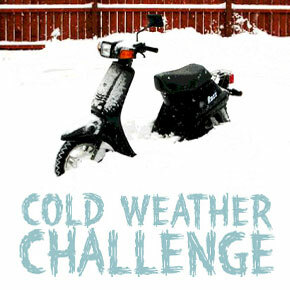 Your CWC story: Fingers got a bit cold even with heated grips and tucano urbano handlebar muffs. Your CWC story: I was heading to the Philadelphia Parking Authority at 3101 Market Street for a meeting of the Motorscooter/ Motorcycle Coalition of Phila. to discuss the pilot program for MS/MC parking in the city. I wore “D” battery heated gloves with silk liners, layered T-shirt/ turtle neck shirt/ leather jacket with thinsulate liner, underwear/long johns/ Swedish military motorcycle bibs (fleece lined), thick socks and leather shoes. Only cold at the toes and fingertips. I added this only as a preliminary CWC ride because of the concerns the riders have been having with the city over their parking rules/ tickets. I’m sure we will get lower temperatures in Philly and have added entries. Last year, Sandor and Joe rode in 6 degree weather. how do i back check for weather??? Your CWC story: 01/02/2010 First ride of the year. 14 degrees at 7 AM when the ride started. Light snow falling, no accumulation on roadways. Facesheild fogging was an occasional issue. The cold will find it’s way through any opening, had to stop and redo my gloves and parka sleeves to stop the draft. All in all, a great ride, nothing like a sunrise with a light snow falling. Story: Today is my 54th birthday and when I woke up it was a beautiful sunny day. The streets were dry and the salt piles minimal. What a great day to celebrate my birthday. Dressed in lots of layers, hooked up the Gerding glove liners and off I went. Had to maneuver around a water main break and piles of salt but that wasn’t too bad. Continued on to church where I was met with dumbfounded stares. Lots of Harley guys frequent this particular church so I had a lot of confused looking folks wondering why and how a scooter could ride in this weather. We play several scooter tag games on our Forum so I decided to pick up an Alphabet Tag along the ride back. I believe it was a whopping 22 degrees for the 16 mile return trip a couple hours later. I had a blast and look forward to the next ride. Your CWC story: I was trying to be a good guy and get to work early. Only to discover that once I got there I had forgot my frikin keys to get in the building!!! Rode back home to get them and then circled back to work. Buurrr and stupid. To avoid traffic, I had originally planned to ride on the Lake Wobegon Trail (snowmobile trail) with my home-brewed front ski (made by shortening an early 70s Arctic Cat ski and triangulating a bracket off the top.) Illnoise couldn’t give me a definitive answer as to the eligibility of using a one-wheel, one-ski scooter in the Cold Weather Challenge, so I reinstalled the front wheel and took some back roads. I only encountered one other vehicle on my ride. Your CWC story: Warm day, still lots of snow on the side roads from Christmas. Ice was melted off the main drags so I went for a little ride. Slippery getting the couple of blocks to the main road, but then a nice ride. 30 degrees is a little wimpy, but thought I’d post. Commuted until Dec 2 this year, might get in a ride every month this winter. Your CWC story: Daily commuter, no heated clothing, no other scooters on the interstate today. Everyone thinks I’m crazy, but this is my transportation. I just have an extreme dislike for cages. Ok, make that cages using cell phones. Your CWC story: Same as 08-09 epic, but without the deer and warmer. Your CWC story : Well I just finished the scooter in my shop and decided for a test run as the customer was not coming in till end of March but decided ti come today so I had to give it a good run. So I fired it up and took it out . Now our shop is in the beutiful Catoctin Mnts. and we just had alot of snow but the roads were clear so I headed out. It was a great ride going up the mountain and I went a route I allways take Rt77 thru the park near camp David. As I started to come back down the other side of the mountain the road I was going down started to get a little bad .There was snow and ice and it got worse. When I got to the bottom I found the way I needed to go to be closed and going back up , no chance the scooter was slipping to much to make it up . So I went around the detour sign and down one heavily snow covered road but you know what the scoot did ok and I made it back to the shop with out a hitch ,except I had to pry my hand form the handel bars. Damn snow. Customer was here and hour later and he wanted to go for a test ride also so I told him to stay of the Mnt. Well he did not listen and returned two hours later with a story of how he got lost and came to a closed road but someone else had drove down it on a motorcycle or something so he followed their tracks. He said he had a tough time but was glad someone else had been there already. mmmm wonder who that was . Any way he loves his scoot .It has not ran for over 25 years and its first two rides where in the cold and snow.